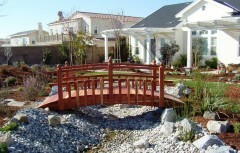 Bring the beauty of peaceful nature escapes to your garden with the Redwood Spindle Curved Rail bridge. All hand-built with hand-selected California redwood. The wood and galvanized hardware will provide structure and stability despite being exposed to outdoor elements. These attractive garden bridges feature square posts with decorative grooves and vertical spindles attached to a single curving rail. Spherical post tops or Solar lights give the bridge a touch of classic style to complement your pond, creek, stream, or yard.